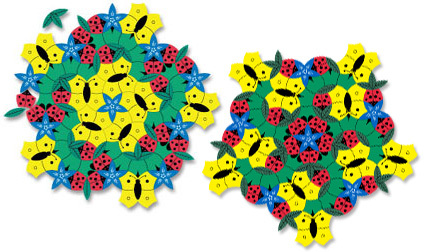 Tessellation puzzles combine art and math to stimulate creativity. Most of them are simple enough for five-year olds, but can also challenge older kids and the brainiest adults. All of our puzzles have many different solutions, allowing them to be used over and over again. 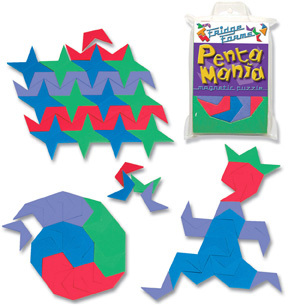 Most of our puzzles are made from EVA foam, a quiet, durable, and washable material. "Magnetic foam" is EVA foam with magnetic backing, a Tessellations innovation that holds the pieces in place on magnet-receptive surfaces. Three things found in the ocean -- squids, sea turtles, and rays -- in blue, sea green, and purple. Every piece fits every other piece for an ocean of possibilities! 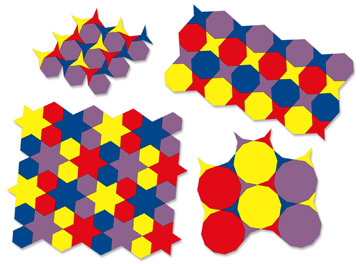 Color instructions show over a dozen different tessellations that can be formed with the set. 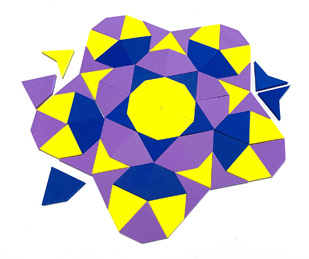 Activity sheets and worksheets that accompany the Classroom Pack cover different types of symmetry found in tessellations, and also characterizing and classifying tessellations using their vertices. Ages 6 and up. Standard Pack - Item 1641, 90 pieces plus color instructions. Form colorful patterns full of arcs of circles with our most popular puzzle! Contains butterflies, ladybugs, caterpillars, flowers, and single and triple leaves. Ages 6 and up. "I got a copy of In the Garden for myself when it first came out, and I have enjoyed rearranging it often over these several years! I keep it on a magnetic board in my utility area as an enjoyable piece of art!" Standard Pack - Item 275, 77 pieces plus color instructions. This geometric puzzle featuring octagons and octagrams (8-pointed stars) was inspired by Islamic art. The octagram and cross tessellation has been used architecturally since at least the 13th Century. The puzzle also contains squares and rhombi. Edges lengths are 1", making the pieces compatible with Tessel-Gons and Tessel-Gon Stars. Ages 6 and up. New Version in 2015! 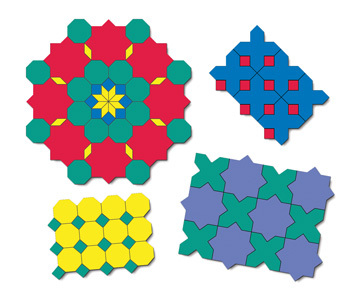 These shapes, also known as Penrose tiles after their inventor, are the favorite tiles of most mathematicians. The pieces have two types of printed lines which indicate matching rules that force the patterns to be non-repeating. Among the many intriguing properties of these tiles is the way in which the Golden Ratio crops up over and over again. Six pages of instructions describe many of the fascinating properties of the tiles. A two-page classroom activity guide is included as well. Ages 8 and up. 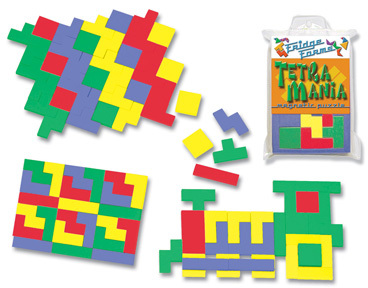 Magnet Pack - Item 288, 105 pieces, in red, yellow, and purple. A geometric puzzle containing equilateral triangles, squares, hexagons, octagons, and dodecagons. 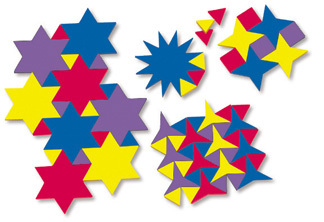 These regular polygons are great for teaching tessellations and geometry concepts. Ages 6 and up. The Classroom Pack includes a lesson guide. Contains star polygons with three, four, six, eight, and twelve points, plus equilateral triangles and squares. This set forms a variety of beautiful and fascinating tessellations, and when used in conjunction with Tessel-Gons, leads to even more possibilities. Both sets have 1" edges for compatibility with Pattern Blocks. Ages 6 and up. Contains the contents of a Classroom Pack of each set and more, including worksheets using the combined sets. Ages 6 and up. Gons & Stars MegaPack - Item 1360, 800 pieces. HexaPlex is an innovative combination of two branches of mathematics with tremendous visual appeal, fractals and tessellations. HexaPlex is not only the world's first fractal tessellation puzzle, but the world's first true fractal puzzle of any sort (excepting computer software). 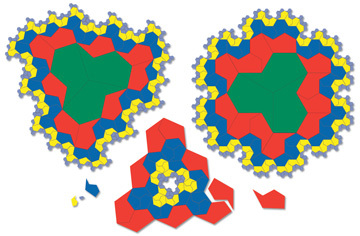 The puzzle consists of five different sizes of the same shape that can be assembled in dozens of different ways. HexaPlex contains 12 pages of instructions with brain teasers and worksheets. Ages 8 to adult. Item 951. Over 270 magnetic foam pieces. Is there a pent-up PentaManiac in you? 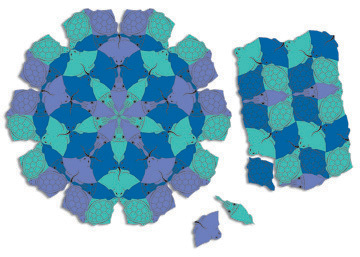 Find out as you arrange and rearrange 56 colorful "folded pentagons" into literally hundreds of provocative patterns. Ages 4 to adult. Item 801. 56 magnetic foam pieces. Solutions to the brain teasers in the instructions. Guaranteed to unleash the triangle maniac in you! 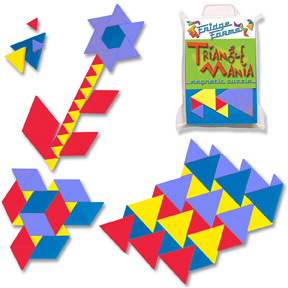 Three sizes of colorful equilateral triangles, 72 in all, form hundreds of tantalizing patterns. Ages 4 to adult. Item 802. 72 magnetic foam pieces. Be warned: TetraMania can strike at any time! They look simple enough. 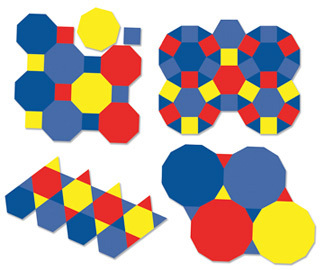 Five shapes made up of four squares that can be arranged and rearranged to form hundreds of tempting patterns. Ages 4 to adult. Item 803. 60 magnetic foam pieces.